To scribble, or to not scribble ... that is the question! When starting out creating maths screencasts you need to decide whether or not you will create screencasts based on freehand scribbling, i.e. featuring your handwriting, a la Kahn Academy videos. Your answer should not be an automatic yes because your decision greatly depends on the hardware you have access to. Furthermore, if you are an iPad user, it is wise to not automatically assume your iPad is your best option from which to create scribbling screencasts. Your iPad may be your ideal screencasting tool, however, after reading the information on this page you may decide otherwise. The video at right features a comparison of iPads, Mac computers, conventional PCs and Tablet PCs regarding five important aspects to creating scribbling screencasts. Click this link to view the table featured in the video. The table above indicates why it is more complex to create scribbling screencast videos from a Mac or conventional PC computer. The two options most people consider for creating scribbling screencasts from a Mac or conventional PC are listed below. However, each of these raises the level of complexity and neither are, in our opinion, recommended for beginners. Mirror your iPad to your computer. 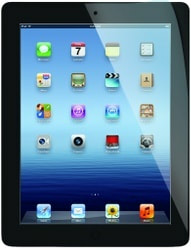 In recent years either Reflector or Airserver have been successfully been used by teachers to mirror their iPads. More recently another option has appeared - Lonely Screen. Avoid initially creating freehand scribbling screencasts. Rather, create some screencasts which do not require freehand scribbling (see below). Use Powerpoint - cleverly, a la the demonstrations below. You might even be able to use your mouse for some annotations! Use OneNote. A tutorial is provided below. 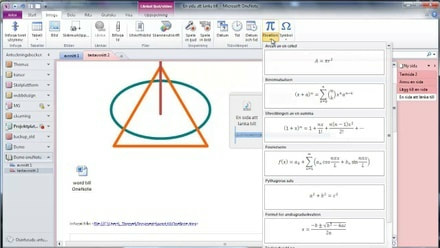 Powerpoint is an ideal tool for all maths screencasters - those who edit their screencasts and those who record their screencasts in one take. Rather that trying the impossible - showing slides, scribbling, talking and recording it all live - set up all your slides in Powerpoint first - including all your scribbled annotations. Want to see how? Check out the video at right - it is gold. Note: This technique is just as applicable for those who edit their screencasts. How to create the annotations sequentially00:36 Rather than doing the annotations as you record, do all scribbling on the one slide before you start recording. The reason you do all the annotations initially is that you need to ensure all your annotations will fit. Once all annotations are complete you will be looking at the final slide (you have one slide and it will be your final slide). Next, duplicate this final slide to make the 2nd-last slide. Delete the final annotation from the 2nd-last slide. Duplicate the 2nd-last slide to make the 3rd-last slide. Delete the final annotation from the 3rd-last slide. Repeat this process until you arrive at the first slide containing the first annotation. Neither Stuart nor I use OneNote. However, we are very aware that for some teachers OneNote provides a 'foundation for their teaching'. Having viewed some tutorials on the web I can see that OneNote clearly has some awesome features which can be utilised when recording screencasts. Check out the tutorial below. There's plenty more on YouTube. Video Tutorial: ​Preparing screencasts with OneNote. ​The video at right - 'Powerpoint without scribbling' - contains three examples of situations where it is better to NOT scribble but to use the text feature in Powerpoint instead. This is a must-see video for all screencasters - especially for those not wanting to initially create freehand scribbling videos. "Does my face need to be in the video?" "Should I create screencasts based on freehand scribbling or use other means?". Below are three recommendations for free, non-editing screencast software for computers, Jing, Screencast-O-Matic and Quicktime (Mac only). Let's clear up some confusion - Jing is arguably the best, free, screen-capture tool. This is because Jing is both easy to use and easy to add arrows, text, highlights, etc to screen shots. But Jing also creates simple, less-than-5-minutes, non-editing screencasts. You automatically gain a URL for the video. If you use Jing, you will not have the option to upload the videos to YouTube, Google Drive, etc. And you won't be able to embed your Jing-created videos into a page. The only option you have is to use screencast.com which will provide you with a link from which the video will stream, but not embed. Screencast-O-Matic comes in both a free and a pro version. The pro version allows for editing at a cost of $US15 p.a. In this tutorial, we are focusing on the free version. You have the choice of direct upload to the web or an mp4 file. Avoid using the web-based system. From my experience it is problematic. Rather, download the program as per any other program and run it from your computer. The pro version is awesome value as a screencast-with-editing tool. However, those who use the pro version extensively and then, years later, discover Camtasia (or equivalent) will regret not having used Camtasia from the start! ​Quicktime - An ideal non-edit screencast tool for Mac! It's super very easy to use. Quicktime produces extremely large video files. See below. 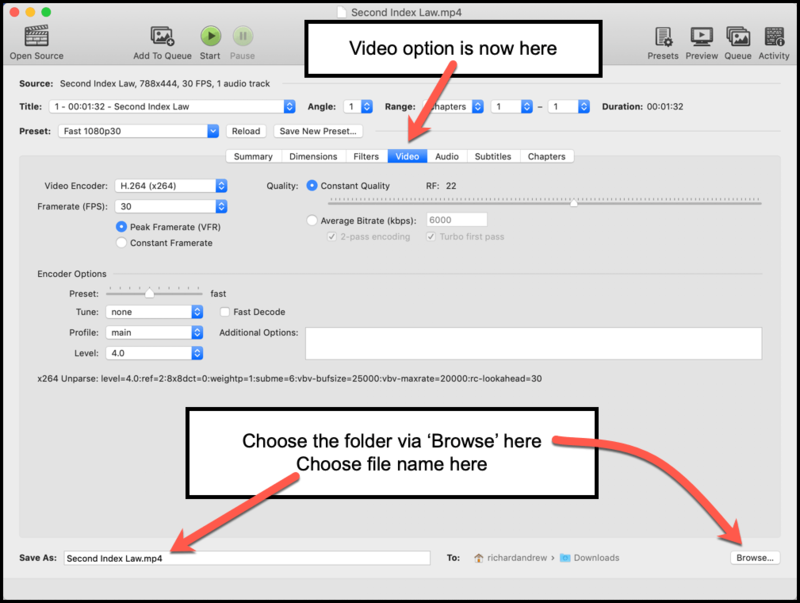 Warning: When using Quicktime to record screencasts you absolutely must use Handbrake (or similar) to compress your video files. I recorded a 1-minute, static, full-screen video with Screencastomatic. I did the same using Quicktime. The Quicktime 1-min video was 172 MB !!! Therefore a proper 5-min, full-screen Quicktime video (with movement on the screen) would be around 1GB! This is an insanely large video and totally unsuitable for streaming to students. The solution is to add handbrake to your workflow. Watch the Handbrake tutorial below - it is very easy to use. Snagit costs $50+ and therefore Screencastomatic Pro is a much better option. Snagit would be an ideal, cost effective screencast-with-basic-editing option if you had a need for a screen-capture tool which is superior to Jing. Personally, I think Jing (or similar) satisfies most teachers' screen-capture needs. However, if you suspect you might make good use of a better-quality screen-capture tool (and therefore could use Snagit for your screencasts), write a comment below and I'll give you some extra information on Snagit. There is a myriad of iPad screencasting options. Beware, however, that iPad screencasting apps are not true screencasting options because each app only allows you to record within the app. A true screencasting app will record the entire screen and you choose what program to use as a basis of your recording. iPad screencasting apps do not, for example, allow you to record a video which demonstrates how to change settings on the iPad or demonstrates different apps. To record such a screencast you would need to mirror your iPad to a computer. Here is a list of commonly used iPad apps. Two of the most commonly used are ShowMe and Explain Everything. Everybody needs to watch this 'Handbrake' tutorial !! Most of the videos you create will need to be compressed. I know, it sounds unnecessary and you are in overwhelm but compressing videos is super easy and very important for any videos over 30MB. This may sound unnecessary and over-the-top however compressing videos is super easy and very important for any videos over 30MB. For those wanting to edit, below is some background info. Again, we are not including tutorials on editing but are including the information below for those interested. Camtasia, arguably the ultimate screencasting tool, is for both Mac and PC. It is easy to use and has awesome editing options. Around $250 with education license options. There is a free trial version but videos created with the trial come with a big fat watermark so the trial isn't great for recording. Info here. If you are a Mac user, Screenflow is pretty much on a par with Camtasia but with a $100 price tag, therefore a fantastic option. (Camtasia for Mac used to cost the same as Screenflow, however recently the price was increased to match the PC version) Screenflow is also very user-friendly. Many schools already have this as part of a suite. Unfortunately, Captivate is ridiculously user-unfriendly. When a '200+ screencast expert' spends 3 hrs trying to get his head around Captivate - using the Adobe-provided tutorials - and makes zero progress, you know there are issues. You have been warned! Already mentioned above. Ideal for those wanting very basic editing on a budget. Although Screencast-O-Matic Pro has many of the same editing options as Camtasia it is not in the same league (you get what you pay for). For those wanting to produce many videos over the coming years Camtasia is worth the extra price tag. The course 'Create and Trial a Flipped Mathematics Unit' is relevant for you if you are wanting to create whole units of work (with a layout a bit like this WINDSSM online workshop) - whether or not you are editing your videos. The course is especially relevant if you are wanting to explore the editing side of screencasts. Choose a time when you have a window of opportunity to explore the course. If you are uncertain of the relevance of the course or you suspect you might already know much of the content, write a comment below or send through an email to richard@learnimplementshare.com and we can help you to clarify the situation. Course information including participant feedback here. Example participant Implementation reports here. I sincerely hope you learned something from this information. Note that this page is a hidden page on the website learnimplementshare.com - i.e. the tutorial is not listed in the website menu nor is it linked from any other page. ​Therefore, you might want to save the url.